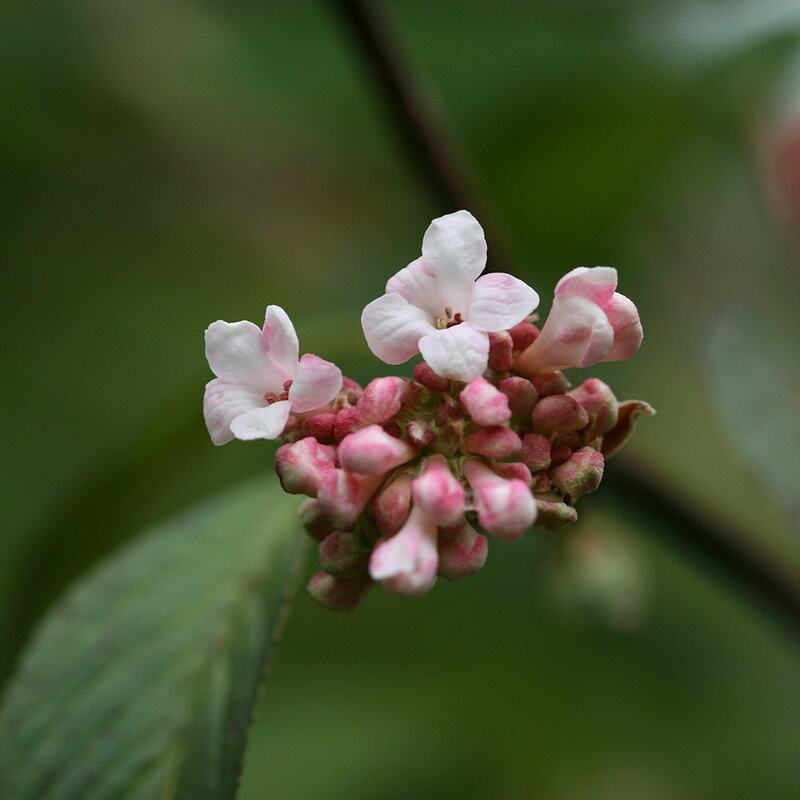 Dense clusters of fragrant, dark pink flowers on bare stems from November to March and toothed, dark green leaves. 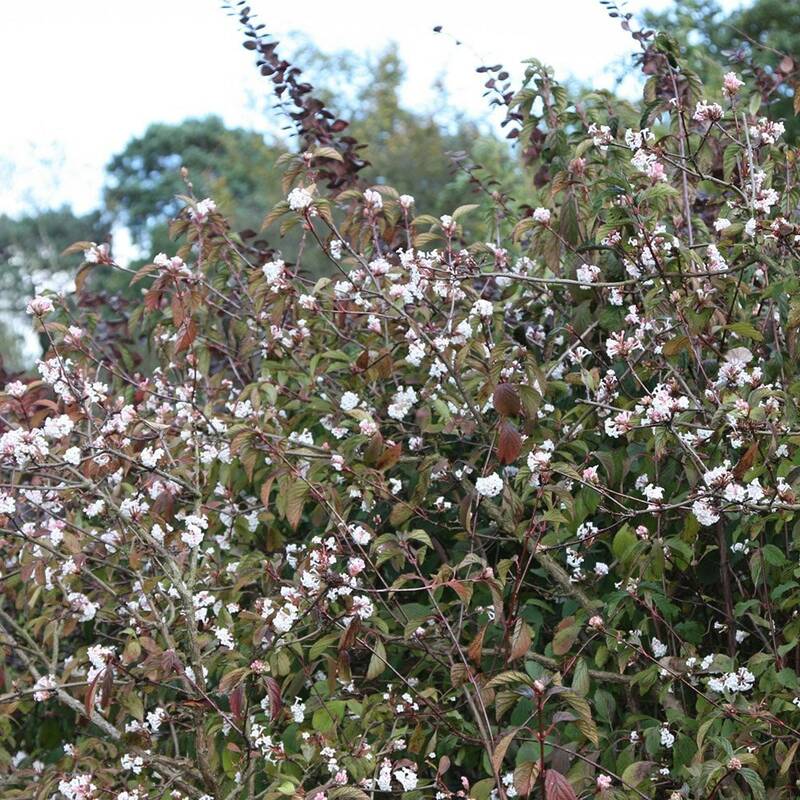 This upright, deciduous shrub is perfect for perfuming winter walks. To fully appreciate the deliciously scented flowers plant in a moist, well-drained border close to an entrance or path in sun or partial shade. My sister in law told me the name of the plant with the beautiful pink bloom in her frosty garden in February. However she lives in the mostly warm south and I live in a cold pocket in Scotland. The healthy looking plant that arrived doubled in size in its first growing season and has had delicate pink blooms since the Autumn and it's now February. It appears totally unphased that the temperature is minus 9 and hasn't got above freezing for a fortnight. I couldn't be more delighted with it; a shrub of joy and beauty at a dreary time of year and all I had to do was dig a hole. A very versatile shrub, you can prune it to fill any space. Really good strong plants from Crocus - always! A lovely plant - but also, coming from Crocus, I know it will be in strong and healthy and will do well! Nothing to dislike the plant is doing well in the garden. Wanted winter colour. Viburnums eventually grow into small trees and I have had this only a couple of years. It is doing well at 900 feet in the North of England, with no particular attention paid to it. Can this be grown in a pot? Yes - provided the pot is large and you keep the plant well fed and watered. It is possible to do this at any time of the year (provided the ground is not frozen or waterlogged), but the best times would be either autumn or spring. 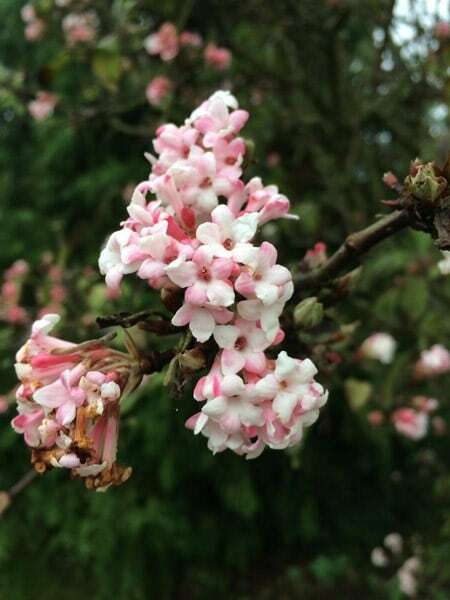 I have just received a specimen shrub from you of the viburnum bodnantense Dawn. However I received no planting instructions and the leaves are slightly curled and browning on the underside and blotched. I am not sure how to plant it or if the leaves are evidence of disease. Can you help please? We have recently moved into this property and the Viburnum 'Dawn' has grown into a small tree and the top half is engulfed by ivy, which we are slowly stripping away.. What is the best way to proceed to rescue this shrub? How hard can I prune it and when? Hello there These plants will tolerate quite hard pruning but I would do this after flowering in late spring. You can either cut out up to one in five branches to the base by removing the oldest and weakest first, leaving the remaining branches unpruned so as not to affect flowering the following year. Alternatively if you can cut all the branches to the base and it usually reshoots. My Viburnam bodnantense Dawn planted earlier this year thrived well until a few days ago. Over a few days the leaves turned brown. What is the problem? Will it survive? Hel please. Hello, The forst thing that comes to mind is drought, so do make sure the plant is kept really well watered until it has become established. Do also keep in mind however that this shrub is deciduous, so it will lose its leaves in autumn - although this is usually a more gradual process. My Viburnham bodnantense Dawn that I bought form Crocus in the spring has thrived well until now. All the leaves have curled and the plant looks as if it is dying. It is in full sun in the afternoons is the current weather too hot for it? I can find no evidence of aphid infestation. Hello, The leaves of these shrubs can look a bit pendent at times and this is often a sign of stress. This could be caused by a number of cultutal things, but the most common are either too much or too little water. My Viburnham Bodense Dawn, keeps having curled up leaves when they re-grow, has it got a disease of some kind?? Hello, This leaf curling may be caused by viburnum aphid. These tend to hit the young foliage in spring, but they usually become less troublesome as the summer progresses - however if you look carefully amongst the young leaves you may spot them. The only effective treatment is a systemic insecticide, which should be applied from early spring. Hello there The bark chippings will breakdown but it will be a slow process. If you want to improve your soil I would remove the bark chippings, then add a good composted compost, and then reapply your bark chipping mulch. Hope this helps. Hi I purchased this plant a couple of years ago but it does not seem to be thriving it has very few leaves and has never flowered. It is alive as it seems to be growing taller it is probably double the height it was when it was planted if not more. I am therefore assuming it would prefer a sunnier spot than it is currently in. Is that a logical assumption could anything else be causing this problem? If not when would be the best time to relocate this plant to a sunnier spot? Hello there It could well be that it is not getting enough light and it is reaching up towards the sun and light, but there could be other reasons that are affecting it's growth, such as lack of nurtrients, or a watering issue or it is crowded in a border. These plants like full sun or partial shade normally, but if you thinbk it is due to lack of light then you can move it while it is dormant between October to March. Hope this helps. Hello, When will be the best time of the year to plant this tree, Viburnumxbodnantense'Dawn' ? It will be planted facing south-west, full sun in the afternoon. Thanks!